The American Western Skulls Collection contains a wide variety of Wild West-themed designs struck by Osborne Mint. The rounds in this collection showcase the popular characters known to generations of Americans from the Wild West. The latest of these entries is the savvy gambler. Right now, 5 oz Colorized Proof Silver American Western Skulls Gambler Rounds are available to purchase online at Silver.com. Ships to you inside of a protective plastic capsule and comes with a Certificate of Authenticity! Seventh round design available in the American Western Skulls Collection! Obverse features the image of a Gambler. 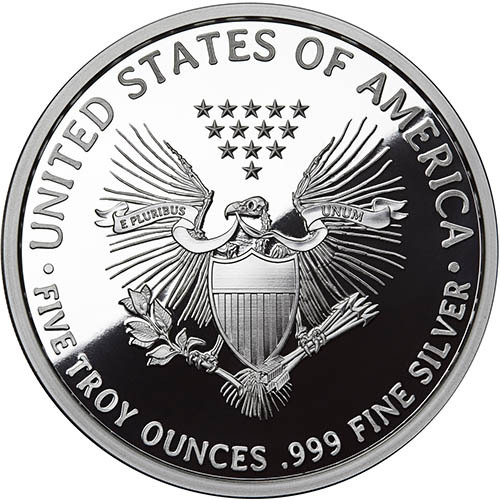 Reverse depicts the fried eagle common to the series. Each of the 5 oz Colorized Proof Silver American Western Skulls Gambler Rounds available through this Silver.com listing comes to you with its own protective capsule and a numbered Certificate of Authenticity. The rounds in this series all feature edge-lettered serial numbers which match the number on the Certificate of Authenticity. Gamblers were common figures throughout the Wild West. Wherever there was a group of folks with free time and extra cash, there was a game of cards to be played. Saloons, bars, riverboats, and even brothels featured gaming tables that offered a sort of recreational outlet for those testing their mettle in the west. On the obverse of the 5 oz Colorized Proof American Western Skulls Gambler Round is the skull of a deceased gambler. The individual has wide eyes as he gazes at the hand no man wants, the Dead man’s hand. Said to be the cards held by Wild Bill Hickok when he was shot dead from behind in Deadwood, Dakota Territory, the hand visible on the round design is that of two aces and two eights, all from the black suits. The reverse of Colorized Proof American Western Skulls Gambler Rounds includes the design of the fried eagle. This twist on the heraldic eagle of the United States replaces the powerful bald eagle with the skeletal remains of a bird instead. All colorized proof rounds in this series have layers of colorized lacquer to bring new life to the design. 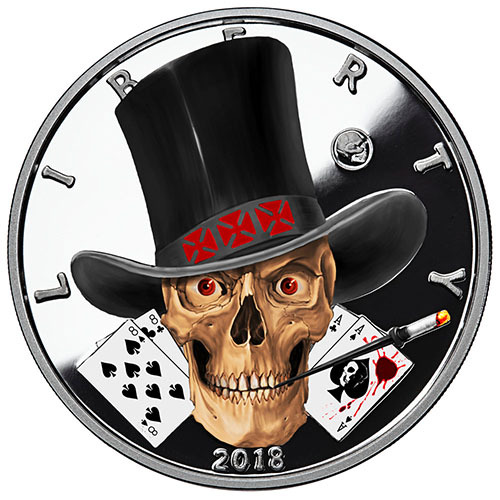 In this case, the top hat of the gambler is black with three red flowers and the playing cards have the black colors to match their suits of spades and clubs. If you have any questions, please contact Silver.com. Our customer service team is available to you at 888-989-7223, on the web using our live chat, and via our email address. Silver spot prices are always listed on our website for your convenience.